WASHINGTON (Reuters) - The Trump administration on Thursday proposed rolling back an Obama-era rule requiring new U.S. coal plants to slash carbon emissions, a move that could crack open the door in coming years for new plants fired by the fossil fuel. The U.S. Environmental Protection Agency's acting administrator, Andrew Wheeler, a former coal lobbyist, announced the proposal. It would allow new coal plants to emit up to 1,900 pounds (862 kg) of carbon dioxide per megawatt-hour of electricity, up from 1,400 pounds now. The move to revive the ailing coal industry, whose share in the U.S. energy mix has been in decline, caused an uproar among environmental groups, who said it ignored dire warnings from the world's scientists about climate change. "We are rescinding unfair burdens on American energy providers and leveling the playing field so that new energy technologies can be part of America's future," Wheeler said at a press conference. He spoke alongside Harry Alford, president of the National Black Chamber of Commerce, a long-time opponent of former President Barack Obama's limits on carbon emissions. 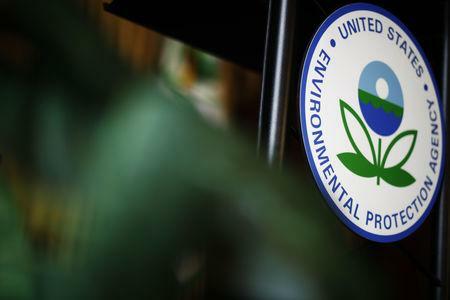 The EPA hopes to finalize the rule after a public comment period. "This proposal is another illegal attempt by the Trump administration to prop up an industry already buckling under the powerful force of the free market," said U.S. Senator Sheldon Whitehouse, a Democrat on the Senate Environment Committee. Under the existing Obama-era rule, new coal plants would have to burn some natural gas, which emits less carbon, or install carbon capture equipment or highly efficient technology that is not yet commercially available. Wheeler argued the proposal would not boost U.S. greenhouse emissions but would actually help drive them down by encouraging U.S. investment in new energy technologies, which could then be exported. "I'd love to see coal plants being built in China and India meet our standards," he said. The announcement came ahead of annual U.N. climate talks in Poland next week, where White House officials plan a panel on coal technology. A U.S. Government report last month found climate change will cost the national economy hundreds of billions of dollars by the end of the century. That bleak picture clashes with the Trump administration's pro-fossil-fuels agenda. "We are not ignoring the government report," Wheeler said. But he added "a lot of the media's focused on is the worst-case scenario." The U.S. Energy Information Administration has projected that coal demand will fall this year to the lowest in 39 years, as the power industry moves further toward natural gas and renewables like solar and wind. The government lists plans for two new major coal fired power plants over the next five years, which could benefit from the EPA’s rollback. Still, it also lists plans for 77 retirements. Asked if the EPA had an estimate on whether the new proposal would result in many new coal plants being built, Wheeler said that was not up to the agency. "We are not picking winners and losers here," he said. Jay Duffy, a legal associate at Clean Air Task Force, said lifting the carbon emissions limit failed to satisfy clean air law requirements for the best available emissions technology. Senate Majority Leader Mitch McConnell, a Republican, applauded the EPA's proposal, saying it would help families working in the coal industry in his state of Kentucky. "Coal deserves a level playing field, and that's what this White House is trying to accomplish," McConnell said.